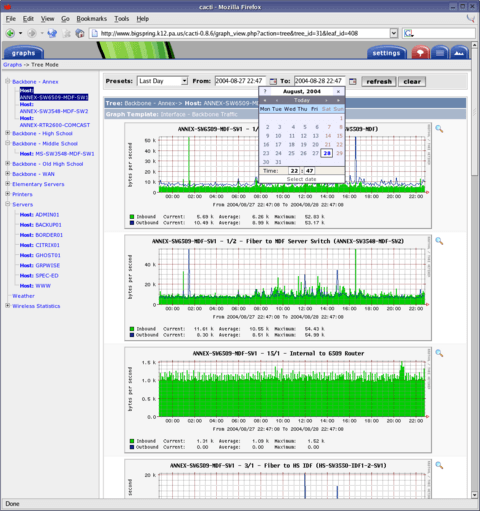 There are many ways to monitor devices: netflow, span port, switchport and so on. Today I will explain how to monitor bandwith, CPU, … of routers and switches using SNMP and Cacti. Simple Network Management Protocol (SNMP) is an “Internet-standard protocol for managing devices on IP networks. Devices that typically support SNMP include routers, switches, servers, workstations, printers, modem racks, and more.” It is used mostly in network management systems to monitor network-attached devices for conditions that warrant administrative attention. SNMP is a component of the Internet Protocol Suite as defined by the Internet Engineering Task Force (IETF). It consists of a set of standards for network management, including an application layer protocol, a database schema, and a set of data objects. Go to “Management” then “Graph Trees” and click on “Add” link. Compile the “Name” field and click the “Create” button. Go to “Management” then “Devices” and click on “Add” link. Compile the “Description”, “Hostname” and “SNMP Community” fields, select the “Cisco Router” Host Template, then click the “Create” button. Click on “Create Graphs for this Host”, select what you want monitor and click on “Create” button. In this tutorial I have decided to monitor Fastethernet0/0, Fastethernet0/1, Dialer1 and CPU. Go to “Management”, “Devices”, select the device with the checkbox and as “Choose an action” select “Place on a tree” and click on the button. After 15 minutes you can see the graph in the “graph” tab. Before this time you don’t see nothing. Remember: Generally the graphs will be updated each 5 minutes! realtime: a method to view Cacti graphs with a resolution of upto 5 seconds. weathermap: a network visualisation tool, to take data you already have and show you an overview of your network in map form.